Can You Afford Your Own In-House Content Team? Content marketing is a vital element of your brand’s strategy. 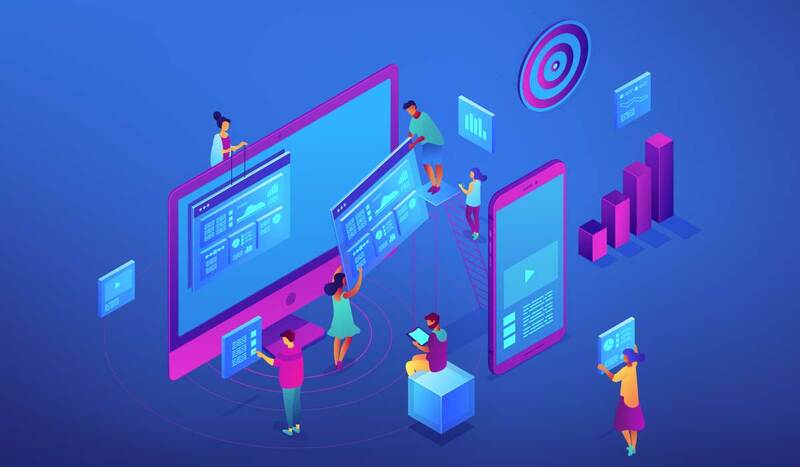 It costs 62 percent less than traditional marketing and generates about three times as many leads, but like any type of branding, effective content marketing does come with necessary production costs. In a former blog post, I talked about the four positions you need to hire for your all-star content team. It explained how filling editorial, writing, distribution (e.g., social media), and inbound marketing positions can strengthen your content and help your company establish credibility. But how much do these positions actually cost, and can your company afford to fill them? High-quality writers are difficult to find these days, but ensuring your company produces high-quality content that your readers will find valuable is the foundation of a successful content marketing strategy. Spammy, low-quality content might get you a few short wins initially, but readers will notice, and that content could tarnish your brand’s image permanently. Finding exceptional writers is an area you cannot overlook. Good writers will use research, intelligent thinking, and a little creative magic to craft interesting, educational content for your niche market and save the rest of your content team time when editing that content. According to Indeed.com, the average salary of an experienced content writer is $61,000, depending on your industry and needed expertise. In my post, I discussed how an inbound marketer understands the SEO value of your content and how to measure key metrics, which are important for gauging the ROI and effectiveness of your content. An inbound marketer will also understand how details such as title tags, meta descriptions, and Google Authorship tags can impact the visibility of your content and website. Hiring an inbound marketer who understands your company and practices “white hat” SEO (i.e., not paying for links and gaming search engines) will help Google find your quality content, make it easier to share, and help your brand avoid serious penalties from Google. On average, Indeed.com shows that inbound marketers (and similar SEO specialists) also make around $61,000 per year. Hiring an experienced editor is essential for establishing a consistent voice and producing clean copy. At Influence & Co., we have an entire department devoted to editing both our clients’ content and our internal content. Having the same people edit and restructure the work helps maintain a consistent style and brand voice. Tweet this Editors also understand what publications and readers are looking for and can ensure that your content aligns with those expectations. Indeed.com shows that the average salary for a managing editor or online editor is around $49,000 per year. Senior editors can make up to $71,000 per year. 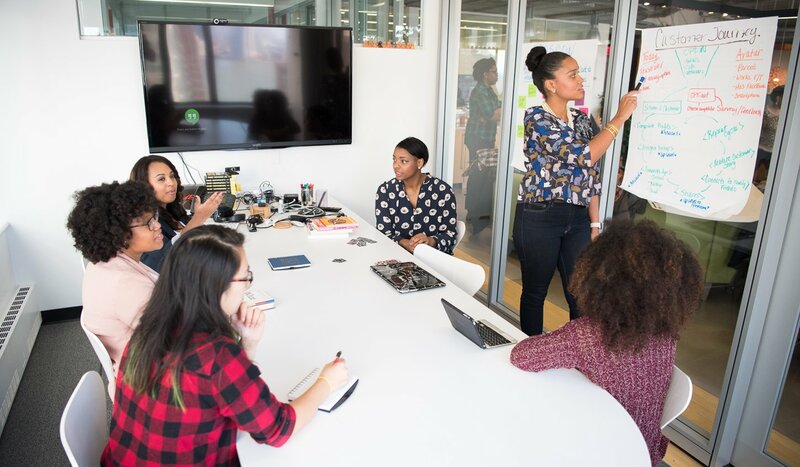 A social media manager or community manager is key for managing your content distribution, engaging your audience online, and building relationships with influencers in your space. Although some of you may think a social media “person” isn’t necessary, I strongly advise you to reconsider. Building your brand online takes time and a consistent voice/personality — one you usually can’t achieve with an intern or freelancer. Additionally, this person also spends the time activating each piece of content through other paid and nonpaid distribution efforts. 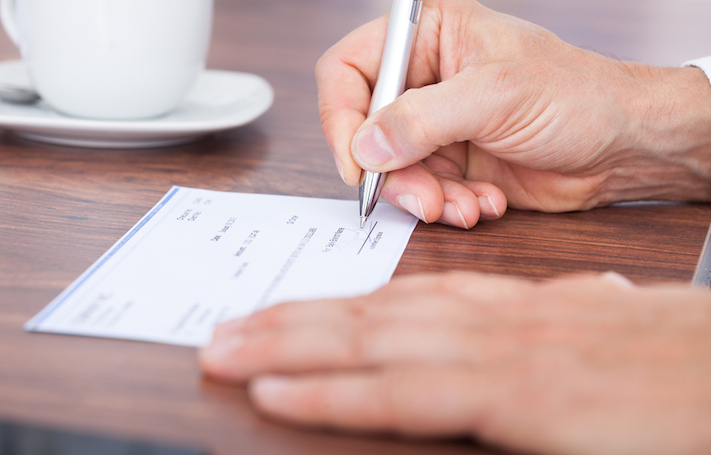 This position can cost you an average of $50,000 per year. 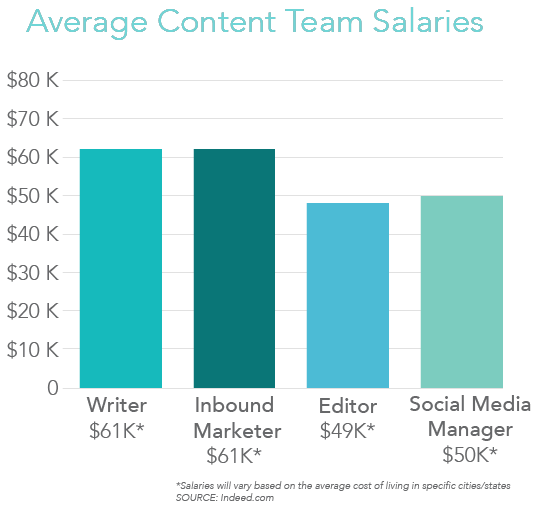 Now that we’ve reviewed potential salaries for your content team’s positions, let’s do a little math. Note that salaries will vary based on the average cost of living for your city, but your all-star content team requires a budget of approximately $221,000 per year. These numbers aren’t intended to scare you or deter you from investing in content marketing, but to show the true cost of effective in-house content creation and distribution. You can hire independent contractors (also known as freelancers) or work with a content marketing firm. Choosing between the two comes down to your company’s goals and budget. Freelancing can meet short-term goals fairly efficiently. Take a peek at the chart below to see the pros and cons of outsourcing content to a freelancer. As you can see, hiring freelancers to handle your content marketing is a budget-friendly option and can work perfectly for seasonal businesses in the short term. Plus, outsourcing to contract workers gets content creation off your team’s plate. However, it’s important to recognize the long-term disadvantages. Using various freelancers to produce your content for months or years leads to an inconsistent brand voice, which can confuse your audience and damage your brand. Individuals who work on a per-article basis also won’t be concerned (or even aware) of your long-term content goals or the actions your company wants to elicit with that content. It’s likely that the freelancer you’ll hire isn’t an expert in your industry, so you can end up with surface-level content instead of in-depth expert content that pulls from research and real-life examples, which your audience needs to understand the information and believe your content is credible. Outsourcing to freelancers makes sense for: companies that offer seasonal products or services or produce content on various topics that require multiple areas of expertise. Hiring freelancers can also work for companies that are just starting out and need a quick, low-budget content solution. Long-term strategy isn’t in play. For example, if a local newspaper asks you to write an article, you’re really just worried about producing one quality piece and not worried about how that piece fits in a bigger content strategy six months down the road. Partnering with a content marketing specialist or firm takes the load off your employees while avoiding the issues that come with hiring freelancers. 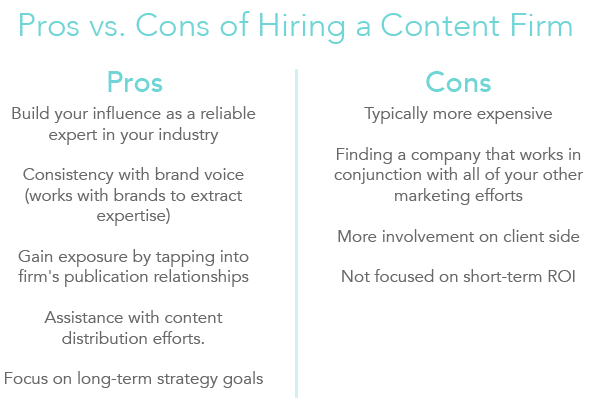 See the list below for the pros and cons of partnering with a firm that specializes in content. When vetting a content firm, make sure the company not only understands how to create quality, engaging content, but also how to make it thrive outside of the publishing platform. Leveraging that content on social media, repurposing it, and engaging in online discussions can help your content gain traction and do more for your brand. At Influence & Co., we offer various programs to fit your goals, from thought leadership to blog strategy. We work to position your brand as an industry leader by producing content that sparks thoughtful engagement within your community. To amplify that content, we consult our clients on how to maximize their content. When searching for a content firm, be sure to ask how it plans to leverage the content it helps you create. Without exposure, even the highest-quality content will fall flat. Working with a content marketing firm makes sense for: a company that is serious about putting a long-term content marketing strategy in place but isn’t ready to hire an entire content team. Companies interested in showcasing their expertise might be better served by hiring a company that specializes in thought leadership content (rather than hiring freelance content creators or engaging an SEO firm). 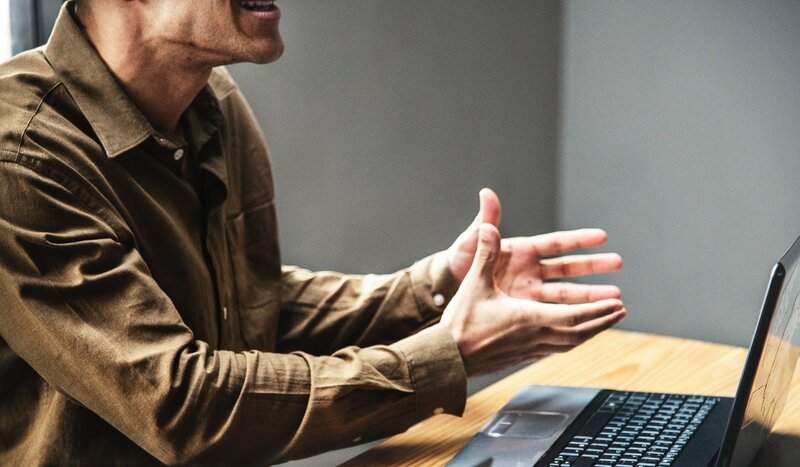 If a member of the team has been unsuccessfully pitching their content to external sources, a firm that has built up publication relationships over time and understands what they're looking for might be exactly what the company needs. Think about how much you can spend on writing, editing, inbound, and social media to determine the best way to execute your content marketing strategy, and be sure to emphasize the true value of content to your C-suite. Your customers deserve high-quality, trustworthy content, and that requires a serious investment. Post by Maya Szydlowski, Content Strategist at Influence & Co.